Early talk about the ★★★★ 2017 Chrysler Pacifica minivan focused on risk. Chrysler gambled when it revived the Pacifica name and dropped Town & Country. It rolled the dice by breaking from the looks of previous minivans and announcing it will eventually discontinue the Dodge Grand Caravan. Valid concerns, but they ignore the one sure thing in the minivan business: Chrysler knows its customers like parents know their kids’ names. A minivan succeeds or fails based on safety, interior comfort, convenience and features. That makes the new Pacifica king of the road. So admire the Pacifica’s exterior while you can. Compliment its tidy dimensions and clean lines. Admire the rakish profile and character lines running stem to stern. Give the LED and taillights an appreciative glance. Because once you open Chrysler’s latest present to traveling families, you’ll forget about the gift wrapping and fixate on what’s inside the package. The 2017 Pacifica uses a brand-new architecture Fiat Chrysler developed to underpin it — and probably one or more big crossovers that will debut later. A 287-horsepower 3.6-liter V6 and nine-speed automatic transmission are standard. All Pacificas have front-wheel drive. The new van is 0.8 inch longer and 0.9 inch wider than the 2016 Town & Country it replaced. Prices start at $28,595. I tested a well-equipped Pacifica L Plus. Features included automatic parallel and perpendicular parking, adaptive cruise control, dual second-row video and touch screens with kid-friendly games, Stow ‘n Go seats that fold flat into the floor, seating for eight, under-floor storage bins in the second row, power tailgate, DVR and USB compatibility, voice recognition, dual power sliding doors, navigation, Bluetooth phone and audio compatibility and more. It stickered at $41,975. All prices exclude destination charges. The Pacifica competes with minivans like the Honda Odyssey, Kia Sedona, Nissan Quest and Toyota Sienna. Secondary competitors are family-oriented SUVs like the Ford Explorer, Chevrolet Traverse, Honda Pilot, Nissan Pathfinder, Hyundai Santa Fe and Toyota Highlander. The vehicles exist primarily to carry six to eight passengers and their gear. 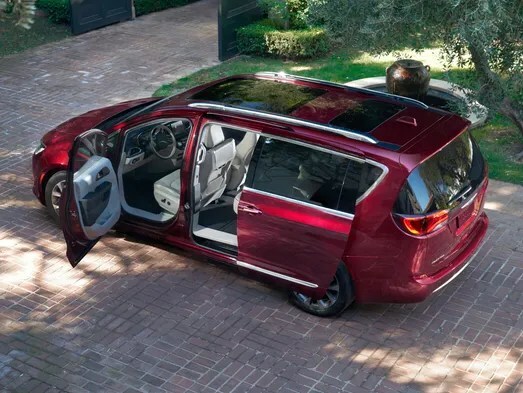 Other than styling, the biggest differences between minivans and family-carrying SUVs are sliding side doors and seating that allows parents and kids to move from one row to another. Those features make minivans outstanding for families with young kids. 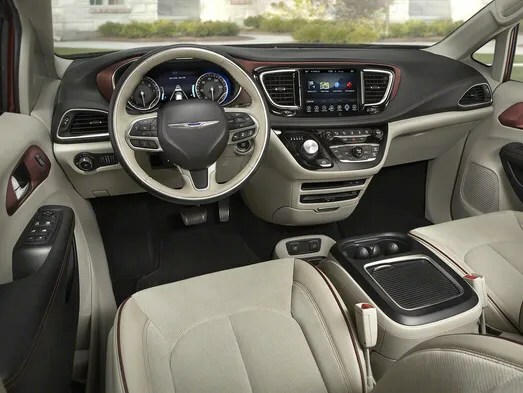 The Pacifica’s interior is spacious, roomy and comfortable. The materials look and feel good, including simple dials and buttons for audio and climate, excellent voice recognition and an easy-to-use touch screen. My test van had bench seats in the second and third rows, and a big console between the front seats. That layout maximizes people-carrying capacity and provides loads of storage, but eliminates the center aisle many minivans offer for easy access to all seats. The middle seats flip up easily for access to the rear. Folding both rows of seats into the floor for max cargo capacity is also easy. Twin screens mounted in the back of the front seats can be used to play video — with wireless headphones — or to play travel games on long trips. The games include versions of Hangman, the license plate game, ticktacktoe and more. You can play against the computer running the game or versus the occupant of the other seat. My niece, nephew and sister-in-law — who remains a kid at heart — found the games captivating. Parents are likely to find kids eager to stay in the Pacifica after they reach their destination. The 3.6-liter V6 features fuel-saving idle stop and delivers plenty of power. The nine-speed automatic transmission shifts smoothly. The interior is quiet at highway speed. The Environmental Protection Agency rates the Pacifica at 18 m.p.g. in the city, 28 on the highway and 22 combined. The key combined figure beats those of most competing minivans. The Nissan Quest achieved 23 m.p.g. 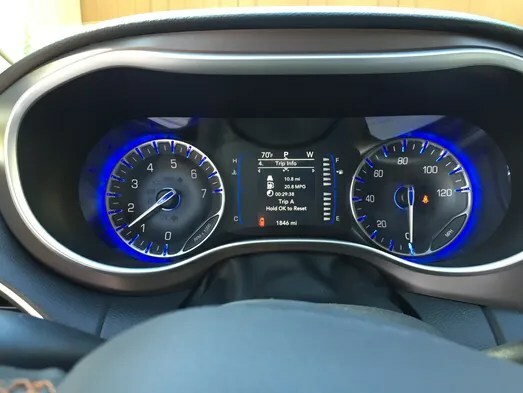 The Pacifica offers a rich range of safety features, including 360-degree parking cameras; blind-spot, cross-traffic and lane-departure alerts, and front- and rear-parking assist with automatic braking. It’s the state of the art in family transportation. Chrysler Pacifica L Plus: 18 m.p.g. city/28 highway/22 combined. Regular gasoline. Honda Odyssey EX-L w/nav: 19/28/22. Regular. 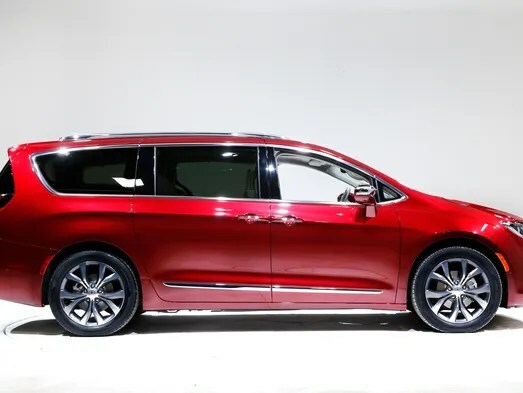 Kia Sedona SX Limited: 17/22/19. Regular. Nissan Quest SL: 20/27/23. Regular. Toyota Sienna SE Premium: 18/25/21. Regular. Power: 287 hp @ 6,400 r.p.m. ; 262 lb.-ft. of torque @ 4,000 r.p.m.